Known as the ideal healing place, the world's nature heritage. Halong Bay is the perfect choice to anyone having attending to run away from crowded and polluted city life. Nothing can compare when you have been awaked up in the middle of sea. Take the long breaths with pure cooling air and melt into the magnificent scenes of wonderful limestone caves stood stably despite of wave or wind. This time, no pressure, no troubles, just only the sweetie moments you get and share. 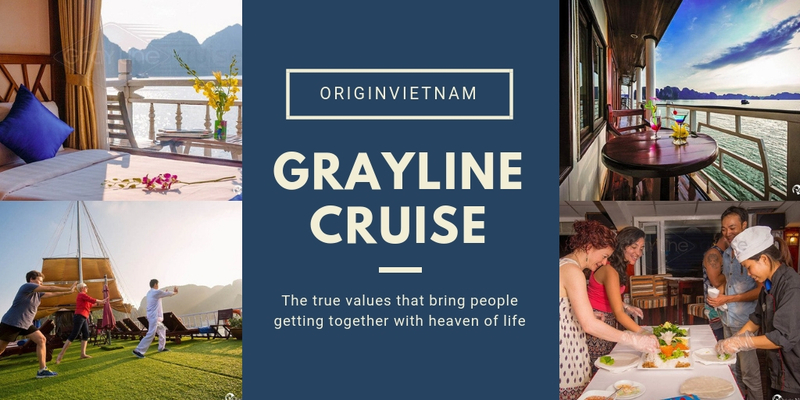 Is as the "no strange" brand of the safety, trusty and professional service and various exciting activities, Gray line Cruise is one of a little Halong Bay itinerary sure that satisfy your expectation. With our different cruise featured by size, designs and service styles in each of boat. Gray line Cruise not only meet at travelling private need. But it also accept for all the request from big or small corporation is going to enjoy vacations on Halong Bay. Is the part of famous worldwide brand chain. Gray Line Cruise making a bold impressed by the unique shape and the perfectly design in details of textures. The special construction made it more special than many others luxury boat in Halong Bay. Looking far away, Gray Line same as the arrogant princess are playing around at her yard. The space of this cruise is focus on family experience, so the privacy always is ensured at highest level. Gray Line not same as the other boats in Bay. When you are starving an empty chair in sharing room, are stuffed and stared at by someone everywhere. In the spacious space of this boat, you absolutely enjoy your world as much as you can. The concept of the décor in cabin deserved as the top – case of art. The delicacy on each of room pieces will easy steal any heart. The harmony in colors, mixing with the top of Vietnam traditional heritage feature. Such as: the hand embroidery in outskirt Hanoi, Dong Ho Art from Bac Ninh province. Especially the ethnic patterns from the North mountain areas in Vietnam… that lighting in the room along with the sophistication in the creative of wood. The open-space with private airy balcony is the final inserts make the pictures of cabin completely perfect. And of course, the high standard amenities are always available in every cabin. Just one thing you have to worry about is how to experience your hy in the most comfortable and romantic way. Firstly, the meals are arranged gently at the time you can enjoy in fullest way of glorious scenes in Halong Bay. Beside of fresh seafood, local cuisines, our extensive knowledge chef team also will serve you the highlight of international foods in anytime you have request. With the caring to every single feeling of customers, our crew always minds about your notes if you are diet or in treatment. Secondly, endless entertaining activities selected will fill your day from morning to the midnight. Not only watching the bay in sundeck, kayaking or bamboo boat rowing. You can hang around a few islands, climbing up the peak of karst tops to see the panorama of Halong Bay by bird-eyes. You also can explore the happiest life of the world in local floating villages or take some massage treatment if having interesting in. The customer spirit on each of experiencing is the most caring of our crew. So all of activities are organized in flexible time, when all people are ready to take part in. The schedules will be sent for you at your cabin the clearest information about it. If you need more other special requests, the great receptionist teams will online 24/24 hours to answer your questions. And ultimately, the truly values of this land in talking, joining in reality is the thing we more consider than visiting the popular place showing off in famous magazines. We hope that after journey, the final result you get, is the most beautiful voyage you looking forward. Over 70% of the Gray Line guests had reviewed that they felt deeply impressed and relaxed with the space of this boat. They also would love to return to Halong Bay or introduce their friends about. How is great of the Gray Line Halong Cruising. For the crew, that is the biggest motivations help them continue to contribute more and more for this itinerary. 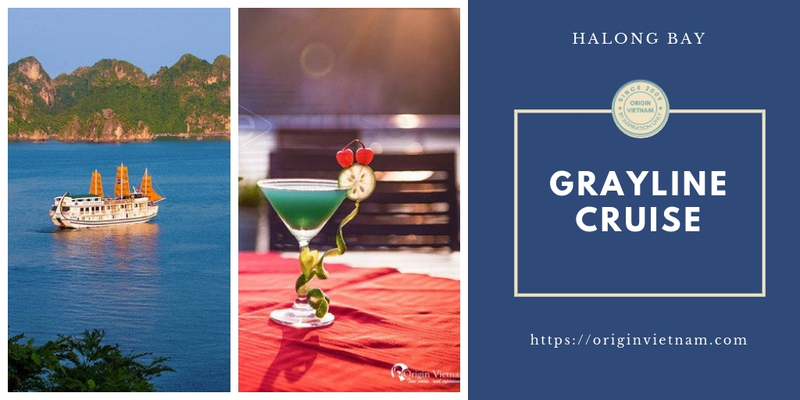 To get more information and review of customer about Gray Line Cruise or other suitable choice for your upcoming plan in Halong Bay. Let connect with Origin Vietnam at: website: https://originvietnam.com or mailto: sales@originvietnam.com. With many years activated in this field, Origin Vietnam team will support you completely from A to Z.